The beginning of a new year is a natural time to reflect on what has occurred over the past 12 months and what is in store for the next. I tend to be fairly forward thinking and less retrospective, so at this time of the year my inclination is to look ahead rather than in the rearview mirror. As I do look ahead, there are a number of initiatives about which I am excited. A calendar with over 25 events already scheduled is available on the Project 60/50 website, and one of the “anchor” events will be a two-day symposium titled, “Investigating and Engaging Civil Rights in Education: Past, Present, and Future.” Sponsored by the College of Education along with the Michigan State University College of Law and the University of Missouri-Kansas City School of Law, this symposium will examine how school desegregation and integration have progressed in our society – with a particular focus on Detroit and Kansas City – as a result of the Brown decision and the passage of the Civil Rights Act. Speakers, who will include prominent faculty involved in school desegregation litigation, as well as lawyers who have worked on these cases, will address audiences on both the MSU and UMKC campuses. The talks will be videoconferenced to both campuses. 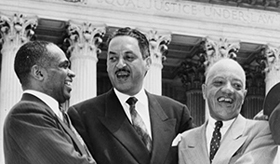 In addition, many faculty in the college – as will be occurring in other colleges throughout the university – will be focusing in their courses on the Brown decision and the Civil Rights Act, and the impact both have had on education in our nation. At the college’s spring commencement ceremony, we will be featuring as our speaker one of the key players in the civil rights movement. I apologize for the tease, but we have not yet publicly announced the speaker; trust me when I tell you that this person played a pivotal role in the desegregation of schools in our nation. We are extremely excited to have this individual joining us to speak to our graduates, so keep watching our website for more information. Another initiative on which we will be embarking in the new year is a partnership with the global technology company Wipro, Ltd., to help increase the supply of highly-trained science, technology, engineering, and math (STEM) teachers in the country’s urban school districts. Wipro, which is based in India but has over 10,000 employees in the U.S., is providing $2.8 million to the College of Education for the Wipro STEM Fellowship Program. The program will start with a partnership with Chicago Public Schools (CPS), the nation’s third largest school district, and where the college places teaching interns each year. The program may be expanded to other urban districts in the future. In all, more than 100 teachers will take coursework with us that will lead to a Graduate Certificate in STEM Teaching and Leadership, and which will allow these teachers to implement innovative teaching strategies in math, science, and technology classrooms. You can also read Wipro’s announcement of the grant. We have another new program related to the training of science teachers in urban schools that will be getting underway in 2014. Supporting Early-Career Teachers of Science Through Urban Partnerships, or MSU SETS-UP, is also funded by a $2.8 million grant, this one from the Noyce Foundation and the National Science Foundation. It is focused on people who have a background in science and are interested in making a mid-career switch to teaching in middle and high schools. Students in the program will earn a master’s degree and secondary science certification with us, and will participate in a five-year fellowship that includes their coursework, and a salary supplement and targeted in-service support and mentoring once employed. The program will build on earlier work we have done through our W.K. Kellogg Foundation’s Woodrow Wilson Michigan Teaching Fellowship. These are just a few of the exciting things I’m looking forward to this year; there is much more going on, so come back frequently to our website to keep up with the activities of the college and our faculty, staff, and students. I want to offer each of you best wishes for a healthy and happy new year. Donald E. Heller is Dean of the College of Education and a professor in the Department of Educational Administration at Michigan State University. Prior to his appointment in January, 2012, he was Director of the Center for the Study of Higher Education and professor of education and senior scientist at The Pennsylvania State University. He also has held a faculty appointment at the University of Michigan. His teaching and research is in the areas of educational economics, public policy, and finance, with a primary focus on issues of college access and choice for low-income and minority students. He has consulted on higher education policy issues with university systems and policymaking organizations in California, Colorado, Kansas, Massachusetts, Michigan, New Hampshire, Tennessee, Washington, Washington DC, and West Virginia, and has testified in front of Congressional committees, state legislatures, and in federal court cases as an expert witness. Before his academic career, he spent a decade as an information technology manager at the Massachusetts Institute of Technology. ← What’s the use of STEM without critical thinking?